The SFMTA painted the Embarcadero bike lanes green yesterday, which will hopefully help signal to drivers that it’s not a parking lane. The SFMTA Livable Streets team wrote on its Facebook page that the Port of SF helped get the paint on the ground in time for the Fourth of July and America’s Cup later this month. The green paint is certainly a step up — don’t get me wrong — but these bike lanes are still unprotected and squeezed in the door zone between parked cars and moving cars. So if we’re expecting to see parents and kids riding the lanes, I’m not going to hold my breath. waste of paint given the width. Ugly. How much did it cost? also, did SF change it’s design standards? I know this is the Port, but usually if cars are permitted to cross a green lane, they dash the green (think Fell/Oak), in this picture there’s a white loading zone but the green lane is solid. Without uniformity in design, we’re asking to be disappointed by (perhaps) rightfully confused drivers. meh. What they should be doing is removing a car travel lane and making the bike lane wide and protected, all-ages and tourist friendly. Traffic be damned, the waterfront shouldn’t be a thoroughfare. Does the green lane continue at least to Hyde Street, or are bicyclists still going to ride on the sidewalk through Fisherman’s Wharf? I know a couple of blocks of Jefferson were recently made more bicycle-friendly, but getting there from the Embarcadero is not real obvious to tourists (except by biking on the sidewalk). 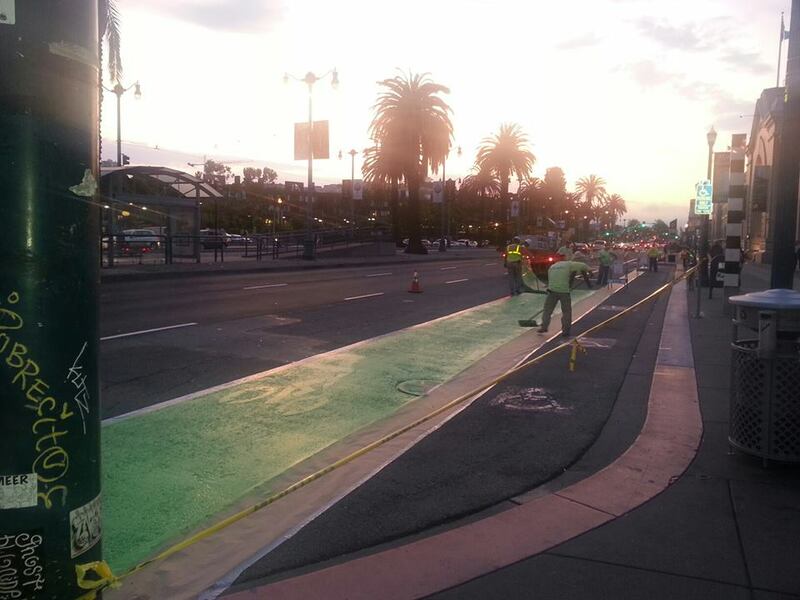 Green paint doesn’t keep motorists from randomly blockading the Fell Street and Market Street “protected bikeways”–why should we expect a different outcome on the Embarcadero? Only hard physical barriers that can damage a scofflaw motorist’s car will keep San Francisco’s bike lanes open to bike traffic. Another small step forward, but appreciated nonetheless because it raises awareness of the need for proper bike infra. Plus, it gives me more credibility when I shout “Get the hell out of my lane!” at auto drivers. If youre shouting that, I hope you understand the law. Because cars are allowed in the bike lane to make right turns, load, and enter parking spaces. Physical protection is what actually keeps cars out of the bike lane. Car drivers may NOT “load” in a bike lane. Limited exemptions apply for commercial vehicles but NO ONE may obstruct a bike lane during commute hours with exception of taxis that are currently loading disabled passengers. Check out the codes: SF Transp. Code 7.2.70, 7.2.71, and see also the Cal. Veh. Codes 21207 and 21209. Actually, they started on Thursday. I covered it in my blog. Doesn’t matter, they were painting on Sunday, which was stupid beyond stupid. I agree. It is beyond stupid. All we get is paint and more paint. What I see are drivers using the bike lane to try to bypass the traffic in the primary. Lovely. Clearly there is nothing one cannot complain about. The painting was happening Sunday to get this done sooner. You should have been out there with me then on EMB. And they could have painted all last week or all this week. It was insanity out there, cats and dogs living together type madness! And what did they do about the insanely unsafe crossovers southbound at Battery? Absolutely nothing! The very least they could do is add a bike box at Sansome so that cyclists don’t have to cross over a lane of fast-moving traffic. Even better would be to eliminate the third lane of traffic that exists from Pier 31 to Battery, and replace it with a bike lane and parking. The turn onto Battery would be like what exists currently at Bryant, where cars must cross over a dashed green bike lane to make the right turn, and cyclists can just continue straight. It’s a similar situation at Howard as well. Of course the dream would be a two-way protected bike lane on the northbound side, but I’ll probably be collecting Social Security before that happens. Still skinny and no protection. Might have used the restriping opportunity to steal a couple feet from the other lanes. But still a nice improvement in terms of visibility. Just having the white stripe repainted makes a difference. 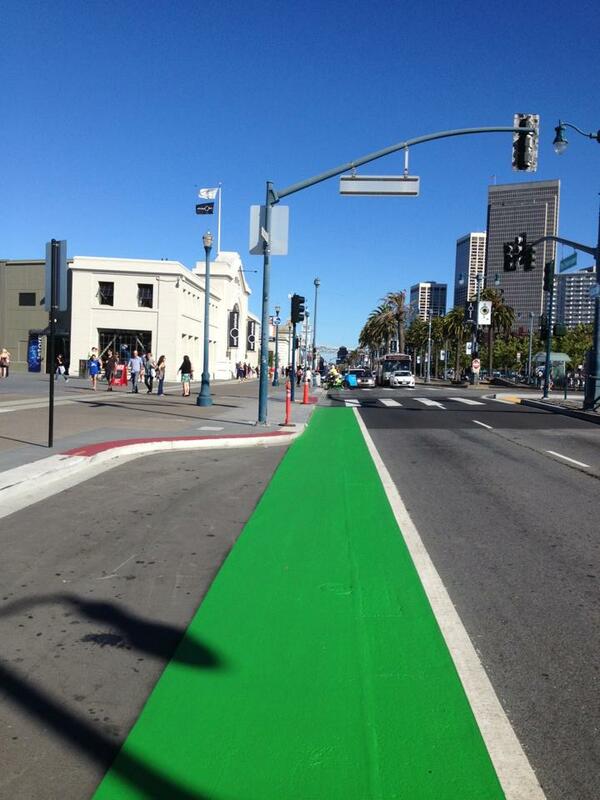 I’m just happy that the SFMTA is growing more comfortable using green paint where it helps improve visibility of the bikeway. Seems like we’ve finally moved beyond “piloting” what countless other cities have been using for years. Eliminate all parking along the Embarcadero and convert the cutouts to exclusively taxi and 2-mnute loading zones. wrong idiot. You can expect a giant luggi on your windshield next time I pass you blocking my lane, forcing me to dangerously swerve into car traffic lanes. except along the Embarcadero and Marina, it is not a sidewalk, but mixed-use trail. For this reason, bikes are allowed, but as you say, must yield to pedestrians in terms of speed and safety. the only exception should be for first responders, and trash trucks during off-peak hours. Taxis and loading in approved cutouts only! Is this really the way SFMTA should be spending their time and energy during the BART strike? Eliminating parking when all folks care about is getting where they need to go? How “smart” of a PR move is that? They rarely do, but @sebraleaves:disqus rest assured that no parking was harmed in the painting of this already existent bike lane. I was thinking the same thing, but perhaps they only dash where there’s a merging zone (e.g., before intersections), but not at every driveway. This green is way too bright and distracting. Almost blinding! It’s visual pollution on the streets. I think a dark forest green would have done the same job and would’ve been easier on the eyes. The whole point is that it’s not easier on the eyes. If something unobtrusive would have done the job, we would not need green at all. As it goes, the paint will dull / grime up in no time. Be patient. I dont even own a car assclown. Learn the law. Where in the law does it say motorists may arbitrarily shut down bike lanes to bike traffic in order to “load”? Rode this today, it’s Howard to Kearny/North Point in both directions. Definitely makes those couple of spots on the east/southbound direction where the bike lane moves to allow for a right turn lane quite a bit more visible. The bright green’s got quite a lot of tire-black and compost-bin-brown coloring to it already. You won’t even need to turn your smartphone screen brightness up to defend yourself from green bike lane induced blindness. Love the green lanes. Sweet.